I just had a copy of NFS: The Run yesterday and after playing it for 2-3 hours all I can say is WOW. Even though my spec is not highly recommended I was still able to play the game in ultra settings with no lag issue encounter. Gameplay: At first I was a bit disappointed because you don't have the freedom to control the game, it controls you! It has its own story that you should follow and all you do is to race the game. I was able to pass until stage 3 where you need to be on 150th before getting into Las Vegas, NV. Its quite exciting at first because every time you finish a race you gain experience and every level you also unlock certain power ups like nitros, gaining more experience from counter flowing, jump, near miss etc. Story: Its like your watching a movie, you also need to press button rapidly everytime the main character is doing a stunt or something. I cannot comment in the story as I was not able to finish it yet. Graphics: Superb! Its very realistic and you will be stunned on how beautiful and awesome the game was. All in all its a great game still though you don't have much freedom to control the game there are also other game modes where you can play challenge mode and you need to finish a race and you will be awarded according to the time. You will also gain level every challenges you finish. I rate this game 8.5/10. (11-25-2011 08:22 AM)radascars Wrote: I just had a copy of NFS: The Run yesterday and after playing it for 2-3 hours all I can say is WOW. Even though my spec is not highly recommended I was still able to play the game in ultra settings with no lag issue encounter. I wanted to play this game but it requires me to upgrade my system. 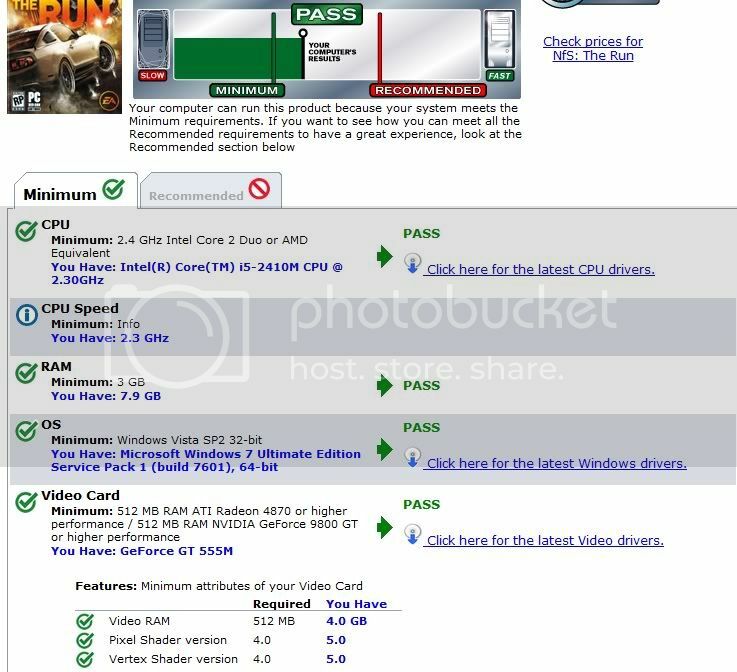 Compare to what is recommended spec of that game my computer spec is not enough using that "Can You Run It" thing. It's such a nice game I often play this game it is one of my favorite games. The graphics of the game are super no other game has the graphics like this game. There so many levels and version of these games. These days, there are a large number of popular and interesting video games available. Need for Speed is one of them. It is really very hard to get tired of this game as it is a great game to play.